...from the malicious clutches of attic tar! 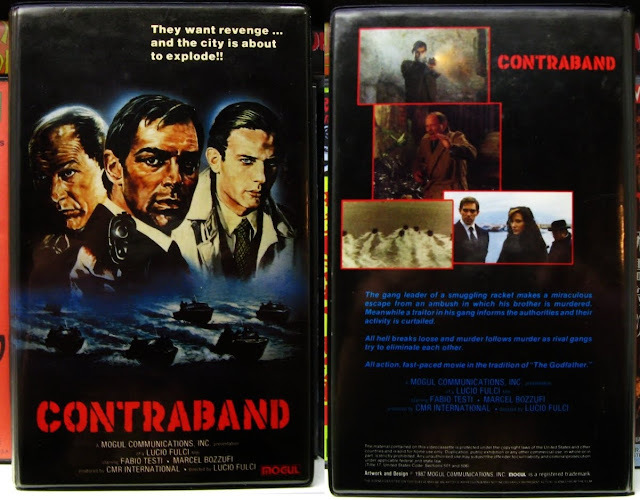 Here's Mogul Communications' clamshell VHS of Lucio Fulci's Contraband (Luca il contrabbandiere) (1980) released in 1987. I dug to the back of my clammers and pulled this one to perform a long neglected cleaning. I thought it was a lost cause as whoever had it before me obviously stored it in a dirty attic. Specks of melted roofing tar were all over the outside of the case and somehow had fallen in between the inner case plastic and cover. After an extremely tedious clean-up, the cover and case are now in excellent shape. I started writing up a belated swap meet finds entry that I didn't get to this past weekend but this took that time away. I figured I'd share the results and I'll post what's new on the tape finds front tomorrow. Sorry about the lack of an actual cover scan, it took about fifteen minutes to get the cover completely back inside the case since it perfectly fits. Looks pretty good to me...the DVD cover is essentially the same but with a light background and I like seeing this darkened version much better. Great movie.